19 Dec 2018 --- Public Health England (PHE) has described the results of its first salt reduction report as a “mixed picture,” with just over half of salt reduction targets being met by the food industry. Companies were asked to meet average and maximum targets for salt content per 100g, with the maximum targets ranging from 0.13g in canned vegetables, to 3.75g in curry pastes. The foods covered by the program provide more than half the salt in the nation’s diet. Set by the government in 2014, the most recent targets cover 28 food categories for the food industry to achieve by 2017. This applies to retailers, manufacturers and the out of home sector – including restaurants, cafes and pub chains, and the categories include bread, crisps and ready meals. While salt reduction has been ongoing since 2006, progress towards meeting food targets was previously self-reported by the food industry. This is the first in-depth assessment using commercial data. Just over half of all average salt reduction targets were met, with retailers making more progress than manufacturers. All average salt targets were met in nine food categories, including breakfast cereals and baked beans, however, meat products met none of these targets. 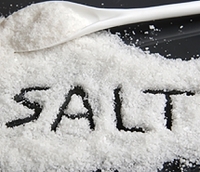 Four in five foods had salt levels at, or below, the maximum targets set. In addition to the targets set for all industry sectors across the 28 categories, the out of home sector was also set maximum per-serving targets in 11 food categories, including sandwiches, pasta dishes and children’s meals. Seven in 10 foods did not exceed maximum targets. Salt levels are generally higher in out of home products, compared to in-home. Excess salt intake can cause high blood pressure, which can lead to cardiovascular disease (CVD), one of the main causes of premature death for adults in the UK. Since it was established, the salt reduction program has helped to reduce the nation’s salt intake by 11 percent, to 8 grams per day, according to PHE. If this figure was brought closer to the recommended 6 grams a day, it could help to prevent thousands of avoidable deaths. Public Health Minister, Steve Brine, comments that the progress is “encouraging” but concedes there is a lot more work to be done. “That’s why we committed to further reducing salt intake in our prevention vision. Next year, we will put forward realistic but ambitious goals, and set out details of how we will meet them,” he says. “While we have seen some progress, those that have taken little or no action cannot be excused for their inactivity. It is clear that, with the right leadership from industry, further salt reduction in foods continues to be possible,” Tedstone adds. In its prevention vision, the government has committed to setting out the next steps for salt reduction by Easter 2019. Salt reduction forms part of PHE’s wider reduction programme that also includes work to reduce sugar and calories in everyday foods.